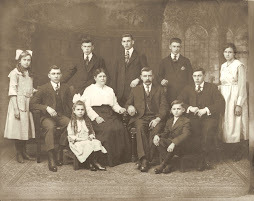 This month’s “Carnival of Genealogy” topic is to pick four ancestors with whom to have dinner. If you could have dinner with four of your ancestors who would they be and why?Would you have dinner in the present day or in one of their eras? Would you dine out or opt for a home cooked meal? What would you discuss at the dinner table? What would you most like to share with them about your life? Hmmmm. I think I would have dinner in the eras of my ancestors to give me a taste of yesterday. Dessert, however, would be in current times so I could give them a taste of today. I would have a home-cooked meal; preferably one the ancestor cooks! Not because I don’t want to bother (sometimes I almost like to cook), but because even as a very finicky eater I think it would be fascinating to eat what they ate. Besides, I’m really not a fan of eating out. Some of what we discuss would be about questions I have about them and/or their family. Some would be about their lifestyles, their hobbies, their work. One ancestor I would like to eat with is Margaret (DOYLE) CONROY (1867-1948). She is the one that has been elusive in the 1880 U.S. Census. She would have been 13 in 1880. She is not listed with her family, William and Mary DOYLE, and children John (my great-grandfather), Peter, James, Mary Ann, and William. I couldn’t find her among neighbors, either. I would ask her where she was in 1880 first thing. With my luck, the answer would be as simple as “at home. I guess someone forgot to list me”. During dessert, in modern times, I would also ask her if she ever found out how her young sons died around 1904. The story goes that one son, Albert, of Margaret (DOYLE) and Thomas CONROY died. They took him back to PA to bury him. When they returned to NYC they found their other son, William, dead. Was it Smallpox? I would hold this question until dessert during modern times because I figure that by now, 104 years after her children’s deaths and 60 years after being reunited with them, she’d be okay to talk about it. 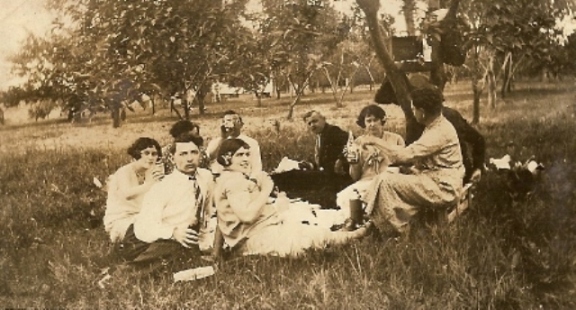 In the picture below, Margaret is at the left, in the darker dress. She's standing next to her sisters, Mary Ann, Alice and Johanna. Another ancestor I’d share a meal with is my great-grandfather on my mother’s paternal line, James O’ROURKE (1876-1944). As I’ve shared in several posts, my first question for him would be “Who the hell are your parents?”. Honestly I don’t know of any other specific questions I’d have for him. I guess I’d just converse about the times. Oh wait! I’d also ask where his forbearers lived in Ireland. I think the next ancestor I’d choose would be Mary (GRIFFIN) McHUGH, my father’s paternal grandmother (1867 – 195?). I’d ask about her birthplace, her parents’ identities and location in Ireland, and through what port they entered. My dad had a story in his head that her family emigrated to Canada, and dad’s paternal grandfather, Dennnis McHUGH, followed them there to take Mary away to the U.S. to marry. Alas, Census records show that Mary likely immigrated to the U.S. at about age 8 and Dennis around age 15. Of course, another Census year states age 19 for Mary (immigration year 1886) and around age 29 for Dennis(1896 immigration year). This information is almost certainly incorrect, however, given that their first born son Patrick was born in PA in 1887. Finally, the last ancestor I’d dine with is my father’s maternal grandmother Justina (NAHODIL sp?) HODICK (1875-1950). First thing I’d ask her is the correct spelling of her maiden name. It was always thought to be NAUCHADILE; however, during my research it is more likely a version of NAHODIL / NAHADIL. It may have been both; perhaps they changed it when they immigrated. I’d ask her where she was born. A family Bible somewhere stated Fuenfkirchen, Austria, which *may* now be Pecs, Hungary (or it may not). Every census record I’ve found her in states Czechoslavakia. Below is Justina with her husband, my gr-grandfather, Edward(1867-1951). With a little luck, each of the above ancestors would be able to answer questions about their spouses’ ancestors, too. I’d like to confirm the 1885 ship Pennland as the one on which Justina’s husband, my dad’s maternal grandfather, sailed with his family when they immigrated to the U.S. It likely is, as the ship’s manifest to the U.S. via St.Kitt’s matches what my dad recalled about the family having stopped in that part of the world before arriving in the States. Also, this ship’s manifest identified Austria as the HODICK family’s country of origin. I’d like to confirm my maternal great-grandmother’s maiden name’s spelling as McCUE as opposed to McHUGH. I’d also like to know her birth name. Her marriage record states Jennie; family knew her as Jane. Perhaps it was Genevieve? Perhaps Margaret DOYLE would have known. I know that someday, when I finally get around to ordering vital recores, many of these questions will be answered. But it sure was fun imagining I could get the answers directly from their mouths! So many ancestors, so little time. Bill West of West in New England challenges the genea-bloggers to describe what they would put on their float in a genealogy parade. I like this challenge! The main feature of my float would be a Train Car. My mom’s family were railroaders in and around Pittston, Luzerne County, PA.
On the train would be a large group of coal miners. My dad’s family were coal miners in and around Nanticoke, Luzerne County, PA, not far at all from Pittston. There would be women around the train wishing their men a safe day at work. The women would be wearing hats. Apparently Margaret Doyle Conroy, the very one I cannot find in 1880, worked as a milliner in NY or NJ. A milliner is a hat maker. 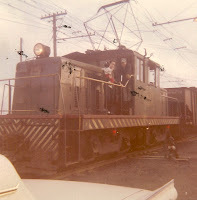 In the background of the train would be a storefront, for the store my great-grandfather Edward Hodick used to own. There would be children around the train, too, all eating Kaloches, to represent the favorite Christmas treat my dad’s mother Mary (Hodick) McHugh used to make. Apparently these are very labor intensive, so they also represent the hard-working people that make up my past and current family. There’s my float. I hope you enjoy it in the Genealogy Parade! I've always enjoyed reading stories or watching T.V. specials that spotlight celebrities of years past. It makes me feel connected to my past, or as if the past wasn't all that long ago. I had a wonderful childhood, so anything that brings me back to it, even for just a short time, makes me smile. This morning I awoke to an email that included an obituary for my mother's first cousin, Mary Margaret "Molly" (Williams) Jurkin. Molly was the daughter of Raymond and Margaret (Doyle) Williams. The obituary was sent to me by a cousin in PA. I recall Molly very vaguely. I know that as a child my brothers and I were taken to the Jurkin house to play. I don't recall what she, her husband (John, who died in 1993), or her children looked like (one child died in 1979, two years after my family had moved from Niagara Falls, NY to Tempe, Az). I've seen pictures of her since -- recent ones at that -- thanks to the aforementioned PA cousin. Molly's sister, Jane, died in 1996. Now Jane I remember quite well. She and her family lived about 6 or 7 houses down from us in NY. Her daughter used to babysit us (but not for long, since my oldest brother wasn't too far behind her in age). She worked for many, many years at our elementary school; in fact, the media center and library is now named for her. One of her sons used to work at the junior high school we attended, and all the kids loved Mike. My dad's sister Norie (McHugh)(Scibilia) Rozanski also died in 1996. I remember her well, too. Those of you who read my Advent Calendar of Christmas Memories blog posts on "The Oracle of OMcHodoy" might recall the picture of me as a child in a hot pink velvet skirt and vest and a woman in a really hot pink miniskirt outfit. That hot woman in the mini skirt was my Aunt Norie. I remember her children well, too. We'd all traveled across the country and back in a truck when I was in the 6th grade. And because we all lived in the same area until 1977, we saw each other quite a bit. My mother's brother Jimmie died in 2005. We hadn't had any contact with him or his family since my mother died in 1988. We spent a lot of time with him and his family, too. They joined us on that cross country trip in 1976, but they chose a different route than us, so we didn't finish the trip together. I was able to track Jimmie down many years ago, but all I was able to get was the location of his daughter, my first cousin. Several years after that and not long before Jimmie died in 2005, I managed to track Patty down and make contact with her and her father. And a little later, her mother. I haven't heard from the other cousins in this line, though I hear about them all the time from Aunt Joyce. The point of this diatribe is this: Sometimes it makes me sad that the people I often wonder "Whatever Happened To..." are my very own cousins ... people I grew up with. Perhaps this is the year I follow Thomas' lead, and make an effort to find out. 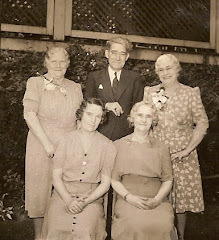 Left to Right: The Hot Pink Family, with Norie sitting on the armchair; Uncle Jimmie and his mother, my grandmother, Regina Doyle O'Rourke; Mary "Molly" Williams Jurkin; Jane Williams Johnson. Miriam at AnceStories2 asks readers to think about issues related to Civil Rights and Diversity, in preparation for Martin Luther King, Jr. Day and Black History month in February. This post will address the main questions she poses. *What was the racial, ethnic, or religious situation in the community where you grew up? Was your family part of a racial, ethnic, or religious majority or minority? Were there differences in your community or family such as developmental disabilities, mental illness, or social class differences? Were there bi-racial or mixed-faith families? The neighborhood where I grew up was in the outskirts of Niagara Falls, NY. Our subdivision was and still is called Colonial Village. My house and my immediate neighbors' houses were in the Town of Lewiston, while about 6 houses down was the Town of Niagara. It was truly a great place to grow up. Think Erma Bombeck. It was that type of neighborhood. Neighbors watched out for each other; no one cared if kids cut across your lawn (well, except for the people on the other side of John, Kevin, Chris and Traci -- we had to take their driveway down to the road, pass "that" house, and cut back up Mark and Cheryl's lawn). Everyone gathered at one house and just played. Heck, summer weekends half the neighborhood packed up their fold-down trailers or tents and went camping together (Bedford Beach was the most popular destination). There really wasn't any cultural diversity in this neighborhood, though. I don't recall a single black family. Across Saunders Settlement Road were Native American families, and we went to school with their children, but our little block didn't have any that I recall. There were different religions; mostly Catholic and Presbyterian I think. I'm not sure that's accurate either, as it didn't seem to matter. Would it have mattered had families of other ethnicities lived there? I don't know; I'd like to think it wouldn't. In my family we did have a developomentally disabled aunt, my father's sister Maryann, who had Down Syndrome. She was a love, and I wish I'd known more of her. I remember specifically a story about her involving my best friend. I'd told him that "my aunt is coming over soon". He asked me curiously if it was the "retarded" one. I just laid into him, telling him that she was NOT retarded and he had no right to call her that. Years later it dawned on me that he wasn't insulting anyone; he just wanted to know which aunt was coming over, and the word "retarded" was the only feature he could think of to distinguish one aunt from the other. In fact, it wasn't Maryann that was coming over, but another aunt. Had it been Maryann coming, I may have had a different reaction. To this day, I cringe when someone uses the phrase "that's so retarded" when they really mean "that's so stupid". The original meaning of the word "retarded" (slow, undeveloped, delayed) is no longer valid and the current meaning (stupid) is highly offensive. Yet I hear the phrase so often that I don't have "frown lines", I have "cringe lines". Did your family experience discrimination or prejudice, or were family members prejudiced against others? Have you ever feared for your life because of prejudice? I don't think I've experienced discrimination or prejudice, really. I did experience "old fashioned" expectations, though. I grew up the only girl with two older brothers. My brothers were reemed and/or lectured if they brought home anything less than an "A" in school. If I brought home "C's" I was pretty much left alone. I used to internalize that, and think I was dumb. Once I developed a sense of reasoning (I know, some of you are still waiting for that to happen), I realized the expectations for my brothers included growing up, going to college, working and providing for their families at a higher economic standard than our parents did. The expectations for me, however, included growing up, getting married, and raising children. And yes, this expectation came from the males, not the females. At any rate, it wasn't as important for me to earn good grades as my brothers since I wasn't going to have to "bring home the bacon". So while I wouldn't classify this phenomenon as discrimination, I would classify it as a double standard. One that did, finally, fade away as I entered high school. Of course, when the expectations of me went up, so did my lectures and punishments when I failed to meet them. I'm not really sure which end of the deal worked better! These are only a few of the questions asked by Miriam. She does have a series of questions on what we know of our ancestors' experiences of race/culture/social issues. I didn't respond to these because I honestly have no idea of how to answer them. If you want to see more of what she asks, hop on over to her site. She'll also be posting in the near future (I think) links to others who are participating in her writing prompts so there'll be a lot of food for thought. This is a test post to seek assistance in formatting this blog. This is my first attempt at using the "new" (not so much anymore) format. My other 3 blogs are still in the old format where the "Layout" tab was not available and you had to personalize the blog via the "Template" tab and use html. While I'm certainly not an expert on html, I have to say so far I am not liking this new format. Perhaps after I learn more about it and experiment I will, but for now am glad my other blogs are in the "Template" format. Anyway, I could use some help from my fellow geneabloggers on formatting this blog. Here are some questions. All opinions are welcome, or I wouldn't ask! 1. Color Scheme: I love the background color but not sure about the rest. What do you all think? Don't worry about the link color (the orange one ... ick). I'll change that tonight! 2. Title: I could use some suggestions. So far it's between this one "OMcHodoy Orations" and "Orations of OMcHodoy". As you can see by "Oracle", I have a tendency towards alliteration. Sometimes it works, and I think it works well for the Oracle blog. But alliteration can get too "cutesy" sometimes. Are these titles too "cutesy"? If not, which sounds better to you? If so, tell me. I'm in the middle; sometimes I think it's too cutesy, other times I don't, so I do want opinions and/or suggestions for other titles. This blog will be for stories, lore, memories, writing prompts,etc. 3. Labels: I can now see how they are added with the "new" blogger. Does anyone know how to do this in the "old" blogger (that doesn't have the "layout" tab?). I do not wish to switch my other blogs over. 4. How do I add a hit counter to the website? There isn't a feature for this in the "page elements" section, and in the "html" editing screen it won't accept the codes (i'm using the same ones as I do with the other blogs and it's not working here. It keeps saying it's not well-formed.